I’m sure you’re aware of how important your website is to your brand. That’s probably why you’re throwing down big bucks for an uber-talented web designer. Did you know that how your project turns out largely depends on you? 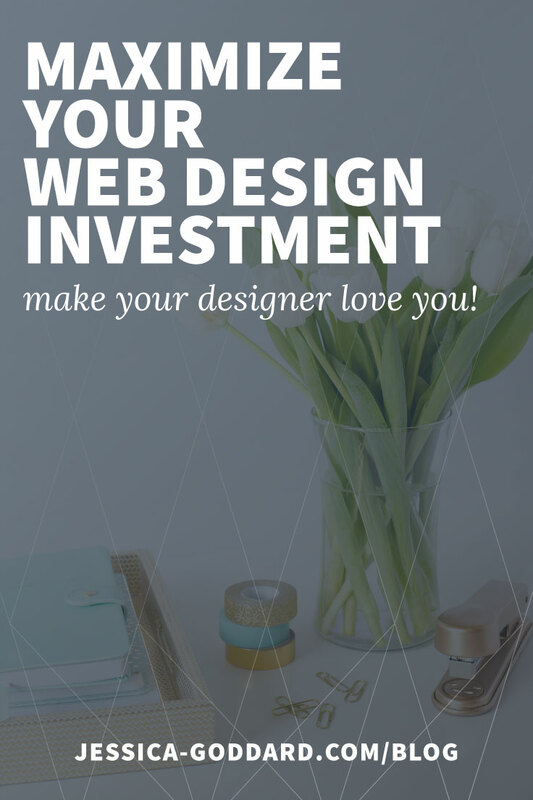 How can you maximize your investment and make your web designer love you? You are an essential part of the design process. No one knows more about your business and goals than you. You are the expert. Your web designer will need quick, well thought out feedback from you during the web design process. Your responsiveness will not only affect the speed of the project, but also the quality. So, commit time to your designer during your project. Just because you are hiring someone doesn’t mean you won’t have any commitments. Ask your designer when you can expect to see her work and schedule time to review and provide feedback. 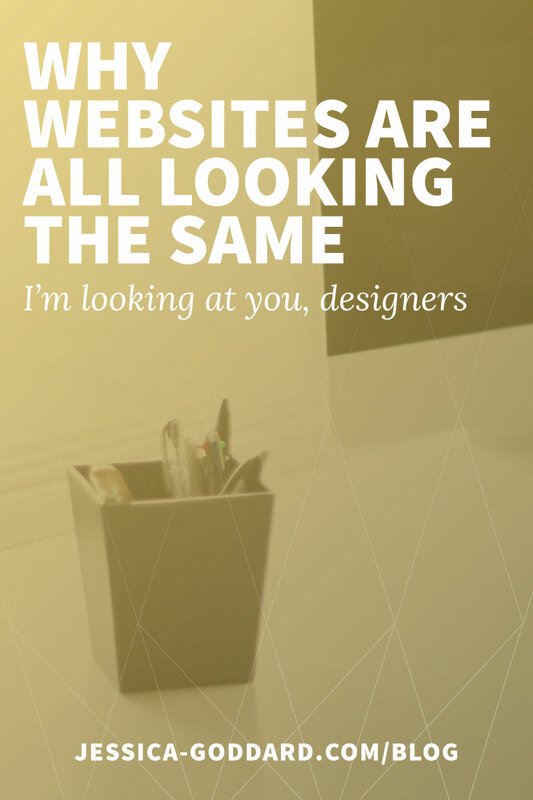 There is a reason you hired someone else to design your website. I’m sure you did lots of research and picked a designer who not only has an amazing portfolio but also has a personality that jives with you. In a web designer, you are not only hiring a creative mind, you are getting years of knowledge and a custom process. Be ready to follow their rules – I guarantee you will have a better result for it. Your web designer may have suggestions for your site that go against what you imagined. Speaking of, if the design looks totally different than what you’ve seen before – YAY! Your designer is going to make your business stand out (and that’s a good thing). Your designer is bringing a lot to the table, but you have some heavy lifting to do as well. Typically providing copy is your responsibility. It’s also the #1 thing that slows down a web design project. Make a plan for how you’re going to create and provide copy. Are you going to write it yourself? Are you going to hire a copywriter? If so, you should coordinate the projects so your copy is ready to go when your designer needs it. Depending on your designer and your business, you will probably also need to provide images and/or videos. Don’t forget to make a plan for these as well! Have you found a designer you love and trust? Do you have the time and money to invest in this project right now? Do you have quality copy on-hand (or at least a plan for creating it)? If you answered yes to those three questions – great! 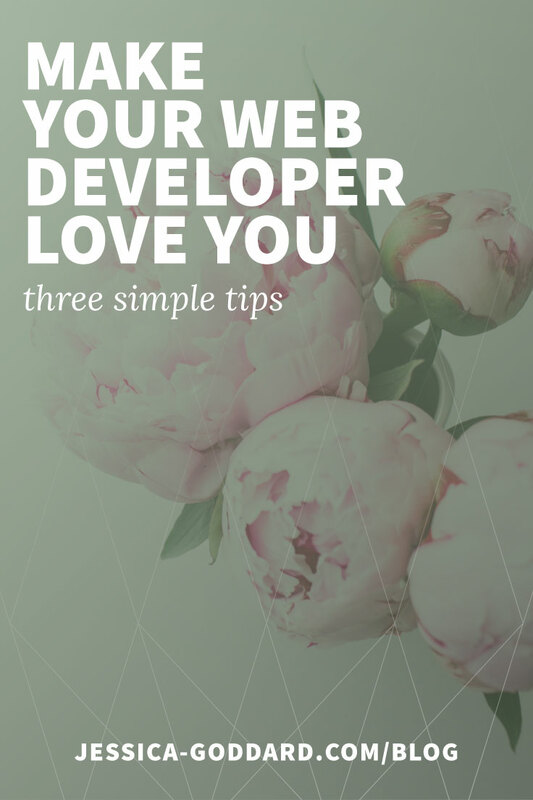 You’re ready to make your web designer totally fall in love with you. Interested in reading more about being a star client? Check out You’re My Favorite Client by Mike Monteiro. You probably see your homepage as a primary focal point of your website. It’s where someone lands when they type your URL into their address bar. It’s a warm welcome and a first impression. What happens when someone new doesn’t see your homepage first? Let’s dissect the importance and purpose of a homepage, then discuss how that needs to be applied throughout your site. Like the front door to your home, the homepage of your website is typically seen as the primary entrance. When someone enters you want to make them feel welcome and immediately “at home” by giving them an overview and providing directions. The homepage of your website should lay the foundation for your business, and the path toward meeting your goals. Someone new to your website should be able to immediately discern who you are, what you do, what they should do next. Most homepages excel at this. If someone types your domain into their browser, it’s pretty much guaranteed that they will land on your homepage. That said, there are lots of other ways people will find your website. 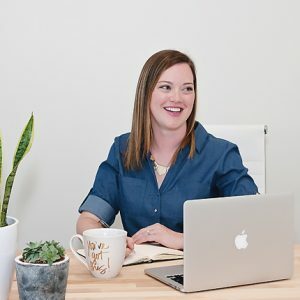 [bctt tweet=”What happens when someone comes to your website and they don’t land on your homepage?” username=”jess_creates”] Are they welcomed into your business? Are they guided in a direction to help them? We’ve established the typical purpose of a homepage, and discussed how visitors come to your site. 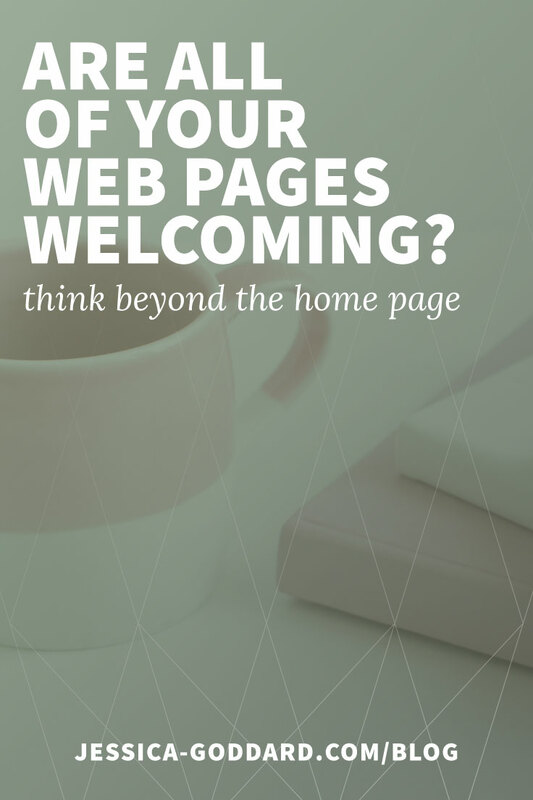 You need to be ready to welcome them on every page. Applying homepage elements to all of the pages on your website will make people feel more welcomed and guided. Is it clear who I am and what I do? Is the page design inviting and brand-consistent? It can be overwhelming when you start to think about tending to the needs of every page of your website. Try choosing one page per week to assess and improve. Still feel a little out of your comfort zone? Consider hiring a web designer to turn all of your pages into magic. Why does your website need to be unique? How many websites have you seen lately with beautiful flat-lay images? What about a color palette of white, blush, and gold? Any hand-lettered logos? How many of those brands stand out in your mind? 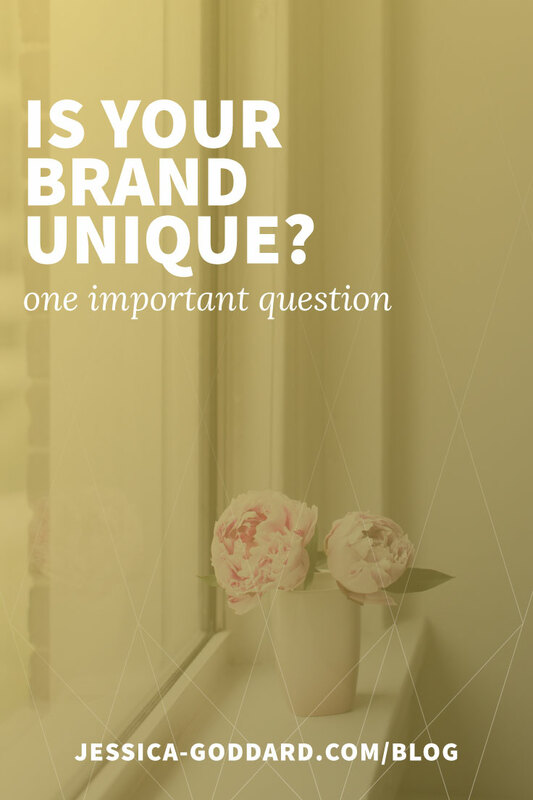 Is your brand unique enough to stand out? Now, before you get upset with me for calling out the trends above you should know – I think they are beautiful. I’ve even designed sites with those elements. You may think you should be doing the same thing as your peers because you have the same dream clients. You may get swept up in the beauty of soft colors and perfectly styled images. I’m here to tell you why being different is so essential. I’m going to assume you want your brand to stand out. You want to draw people in and make them excited about what you do and what you’re selling. You want to build trust and engagement so they keep coming back for more. How much engagement do you think you’re going to get when your users are bored. As humans (and millennials, probably) we are naturally drawn to new and exciting things – brands included. Draw people into your brand by standing out. We talk a lot about dream clients and obviously our brands should be enticing and welcoming to those that we want to serve. It makes sense for most wedding photographers to have a brand that is light and friendly as that coincides with the wedding trends of today. However, there should also be something that sets you apart from all of the other wedding photographers that can be represented in your branding (with or without including blush and gold). One of the most talented photographers I know, CaptureMeCandid, uses black and orange in her branding because she is known for creating edgy, unforgettable images. Talk about connecting with her dream clients! I’m going to challenge you to dig deeper into who those people are (and who you are for that matter) and discover ways your brand can be different to help attract your dream clients. You may not know this about me, but I have a really hard time making decisions. I tend to do a lot of research prior to making a purchase. That research usually involves having an excessive number of tabs open at one time and then abandoning the whole process when I feel overwhelmed. But, just because I’m not actively researching I’m still thinking about my purchase. And do you know which options tend to stand out in my head long after I’ve looked at websites? The unique brands. A unique brand will remain in the minds of your dream clients long after they have seen your website or social media post. This means they have made a connection worth remembering and next time they stumble upon your business there will be an emotional connection and you will have a leg up. So, please, stop trying to be just like everyone else. Find what makes you unique and let that flow into every aspect of your brand. Having trouble figuring that out? That’s what strategists and designers are for! I spend a lot of time on the internet (surprising, huh? ), and much of that time is spent looking at the websites of my fellow creative ladies. I have noticed something websites are all starting to look exactly the same, and I have some thoughts on why this has happened. I’m dishing out a little tough love, so I want you to know that I am 100% guilty of creating websites that aren’t award winning marvels. Reason 1: Designers aren’t aware what is possible. I have been creating websites for almost a decade and in that time a lot has changed. The limits of web design and development are being broken every day. What once was impossible to achieve is now an exciting opportunity. Designers have been told for years by web developers that what they designed was too difficult to implement. That’s not the case anymore, but designers are still restricting themselves to what they believe are limitations of web development. Stretch the limits of your designs without fear of restriction. Reason 2: Designers are limited in their ability to develop unique designs. A lot of us do lots of different things, but we are usually better at one thing over everything else. I’m going to assume your special gift is design, and development is your Achilles heel (if you even venture there at all). As a designer who also develops you are probably limiting yourself to all-in-one WordPress themes and builders which allow you to stay in your comfort zone of design. Developing your own work is limiting your designs. What’s the solution? A web developer, of course! By finding a web developer that you can truly connect with and form a partnership, you can finally have the freedom to push the envelope on design. Now, some things may still be impossible (or just not good practice), but a good web developer will work with you, guiding your designs and finding a solution that is both unique and functional. Reason 3: Designers are copying too much. OK, before you get mad at me because you think I’m accusing you of infringing on copyrights and being totally unoriginal – I’m not. I’m assuming that you start most of your projects with research. You learn about your client’s business, their dream clients, their aesthetic, and their competitors. In that search you are inevitably going to look at lots of websites and you (and your client) will gradually start to gravitate toward implementing a similar design. So, the tricky part is performing the research without letting it influence your design. You can start by getting to know your client’s aesthetics outside their business. Find out what kind of images they are drawn to from a large collection that is totally unrelated to their work. Find out where they like to shop, how they decorate their home, etc. To keep yourself free from outside influence it will probably help to come up with a (new) creative process. Get out away from your desk, let your mind wander and come up with the craziest, most unique designs before reigning yourself back in. I have talked a lot about pushing the envelope on design, but I feel like I should put a disclaimer here, because ultimately the purpose of design is to meet a goal. One goal is certainly to make brands stand out, but we must also create functional and accessible websites that are meeting the needs of our clients and users. So, what are you going to do to help your designs stand out in the crowd? How are you going to make a lasting impact in the minds of your potential clients? Please help me in creating a more unique web with exciting design and implementation. Today I’m going to address a question that I get asked a lot by web designers. Often when editing an existing website there are images that need to be replaced and designers want to make sure the new image is the right size (or aspect ratio) to keep the design intact. 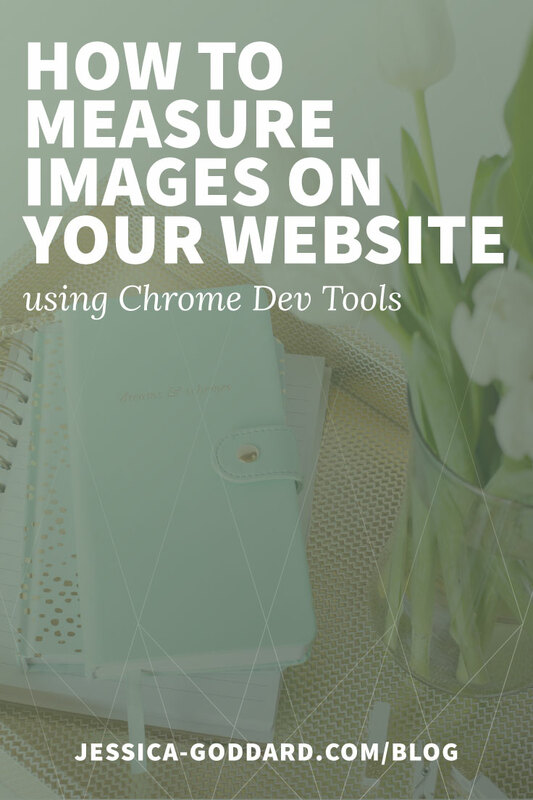 I’m going to show you how to use the Chrome Developer Tools to find the size of any object on a web page, but specifically in this example an image. First you have to open Chrome Developer Tools. You can do this by opening the Chrome menu (three little dots at top right of browser) and selecting “Moor tools” then “Developer tools.” My preferred method of accessing the toolbar is actually just pushing the F12 key on my keyboard because I open and close the developer tools a lot when I am working. Once you have the Developer Tools open, click the inspector button (top left of developer toolbar) then hover over the element you want to measure. Keep in mind that responsive elements on a website will change size based on your screen resolution and/or window size. So, if you make your window smaller, you will see the element size change. If you have you have other questions like this, let me know and I’ll address it in a future post!